The result of this explotation is evident in the middle of the global crisis. 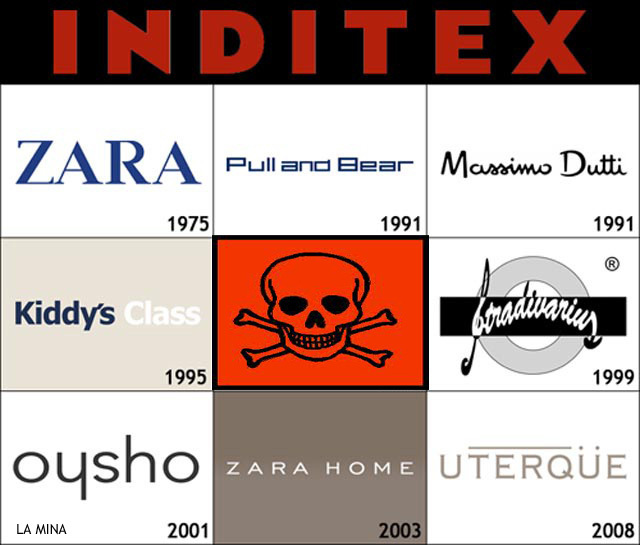 In example Inditex [world first multinational textil group] has dropped 4% sales in Spain an other european countries, but increasing group profits in 22%. This is by selling in the Asian market, to a greater extent, and in the American, the total turnover of the group reached up to 17% compared to same comparative period of 2011. 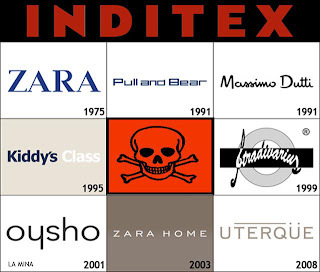 Amancio Ortega [Owner of the hole group] has become this November the second richest man in the world, Inditex knows no crisis but yes the employees: not hired enough staff, exploits existing one and who does not accept the rules it is fired. 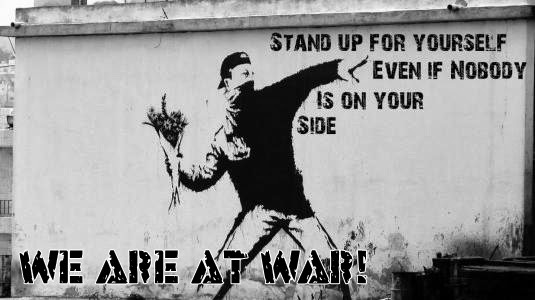 It's time to strike back. Here some actions we can take to stop or slow the sale in stores in the group, depending on the choice we will get a more or less long term. Small looses are big problems for the company. Each store has security arches, depending on the size of the store and the number of entrances there. We will find: metal detecting devices, anti bunker bags (bags filled with foil aluminium paper) and alarms. The company in charge of maintaining the arches takes time to repair and even more if have to replace, and depending on which city has produced such failure or breakage, so at least a couple of days the clothes with alarm output can be undetected. Considering that security personnel in retail stores it is not present in full time, certain number of people in small towns for example could find out what is the best time to go. In these shops in the morning often lack security. Always check the state of the exit arc by nearing "distractely" an alarmed cloth to see if the security system is really broken. 2) Spray in action: Quick and easy. With a command of four or five people: two or three diversion safety employees, throwing dummies, noising. vandalized entry, etc.. while the remaining peers, one for each side of the store are arranged to spray the choths on the walls. Each tent has walls and tables, the tables do not interest us [cheap good]. The small furniture are not of interest because they don't involve large amounts of money to the company and are more easily spare, so we focus on the walls. The walls are the target of the spray, we just need to go running around and creating a continuous line around the walls clothing and general store. The damage from this action is important, talking about spoiling all the product displayed, becouse they remove the painting clohts from the sale at minimum damage. [They will close the store]. If the store is small it is sure they do not have either to replenish merchandise in the store. This is surely one of the great - small actions, with little done maximun damage. A classic. The big crystals take days to relocate once requewsted. Meanwhale they usually clouse the shop. Inditex Window Dresser Service outsourced to the company, so will have to make an extra outlay when the damages remedy. It can take days if produced by several shops, as the team has to move. Each store has some counters and these in turn with "x" cash register with touch screens, without which no one could keep the store running. The more cash register broken less profit for the company, if the operation paralyzed them closed shop. The day of the strike, or every other day. A reasonable minimum of time, small spaces etc just moments. This is undetectable and allow increased thefts. As it was a power surge, security systems, ie alarms, are unconfigured if you lower the tab in the control panel and re-upload. This repeated quickly, system unconfigured just go crazy making and sound without having to do or not to do when you need to. It also undetectable. The result is that systems should be put on hold for review, increasing thefts.